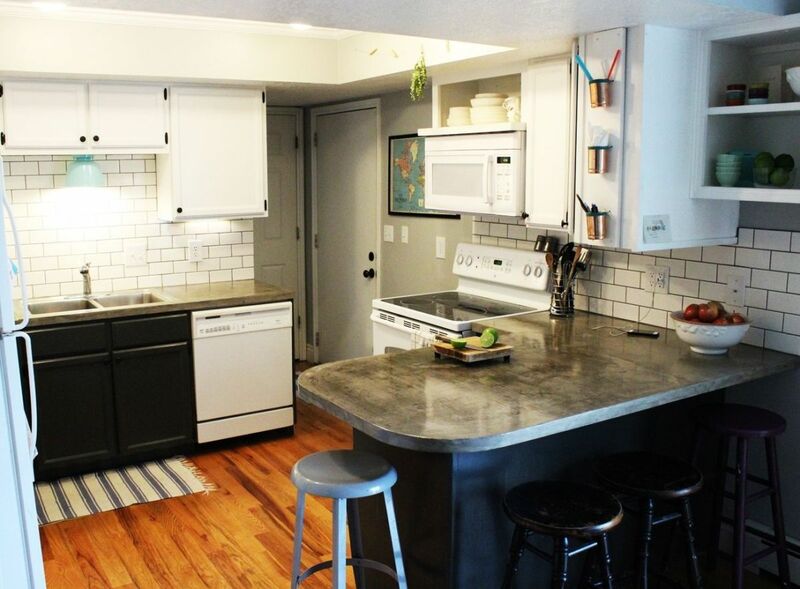 Is the lighting in your kitchen making you cringe? Is it insufficient? Dingy? Horribly outdated? 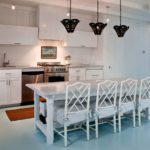 If you are feeling kitchen lighting woes, there is good news for you – updating your kitchen lighting is not as hard as you might think! 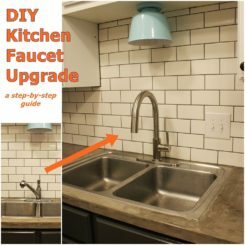 This tutorial will guide you, step-by-step, in upgrading your kitchen lighting in two ways: (1) above-the-sink kitchen light, and (2) under-cabinet LED lighting. 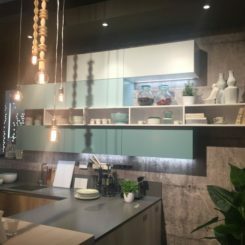 Feel free to utilize one or both parts of this tutorial in creating a well-lit, inviting kitchen of your very own. 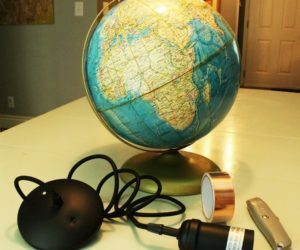 The materials you’ll need for your own lighting project will likely vary from this tutorial. 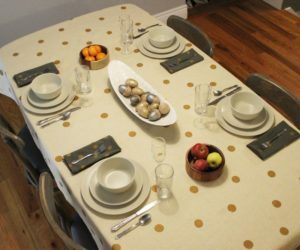 What’s more, every kitchen setup is different. 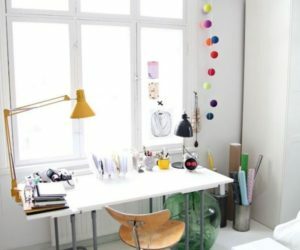 Feel free to glean ideas from this tutorial to fit your own space. 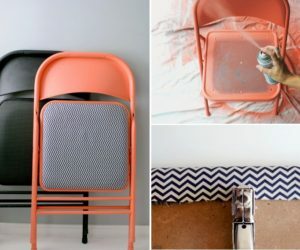 Also, we recommend that you read through this entire guide before determining which materials will be necessary and appropriate for your situation. 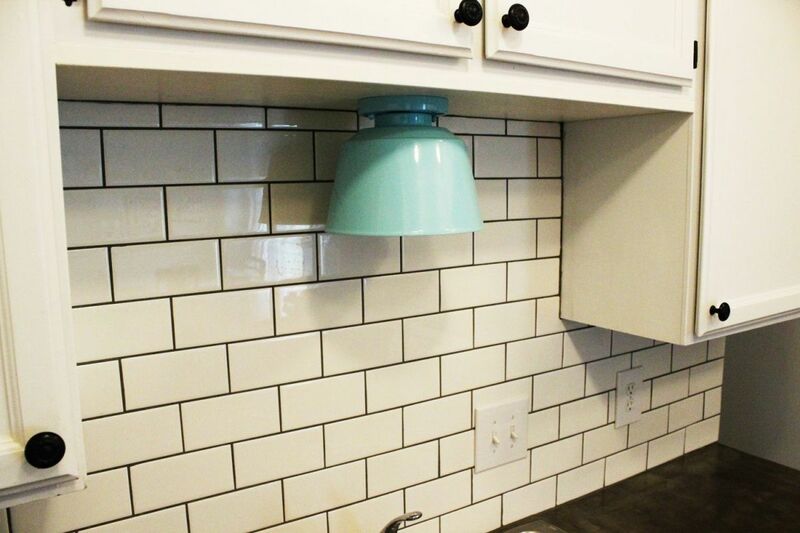 If you have an unsightly above-the-sink light in your kitchen, such as this fluorescent little number, you may be ready for an upgrade. 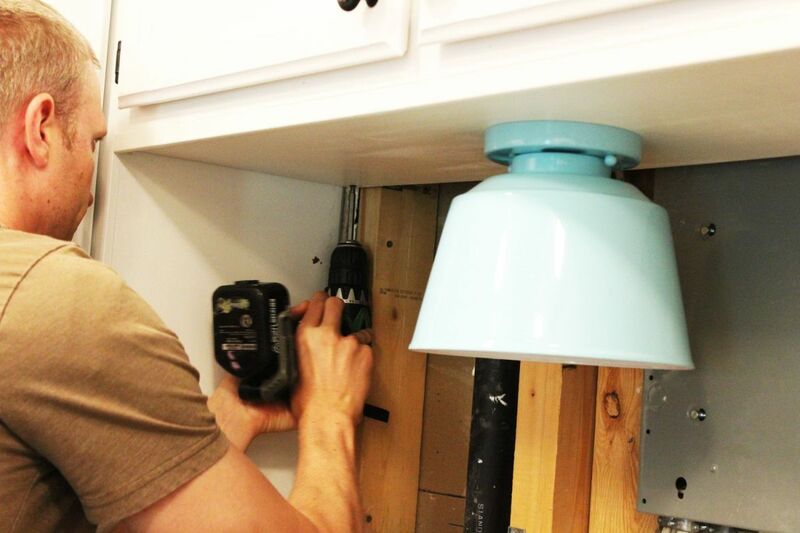 However, it’s not always exactly cut-and-dried to swap out a light when there is cabinetry involved. 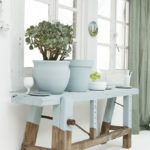 This tutorial will show you one way to completely modernize your lighting without losing precious cabinet “floor” space. 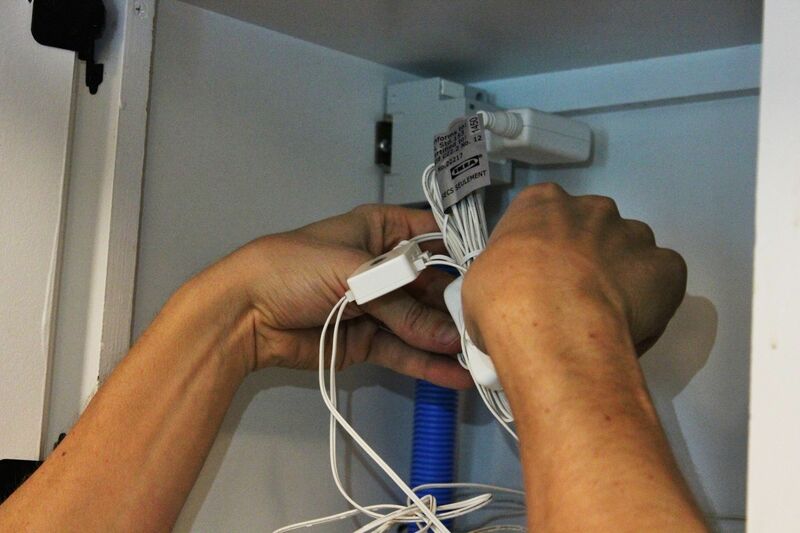 As always with any electrical project, you’ll want to start by turning off all electrical going to your light. Then begin removing the old light fixture itself. 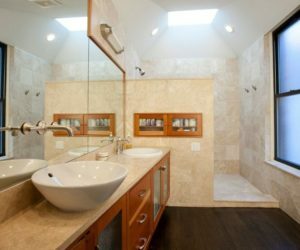 Once it’s removed, you can better see what kind of electrical situation you’re dealing with. 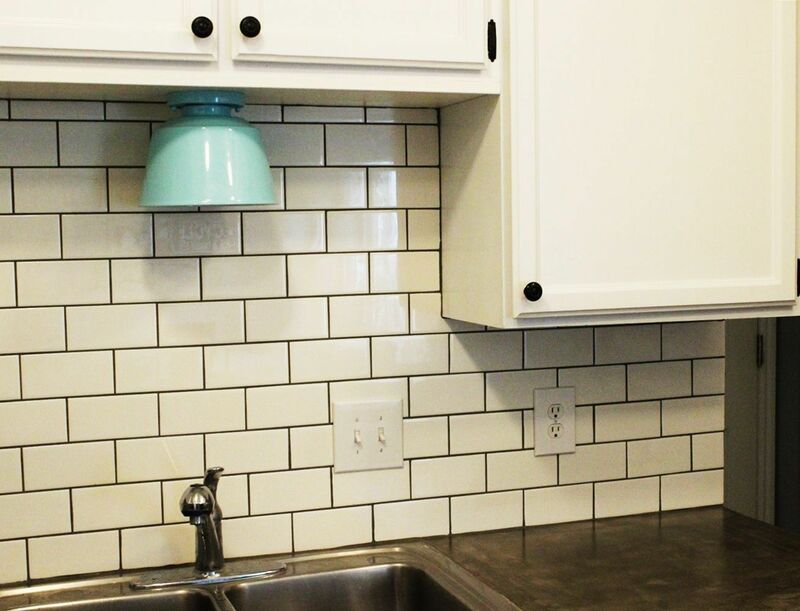 If your new lighting matches up with the old lighting’s wiring, you’re in luck. 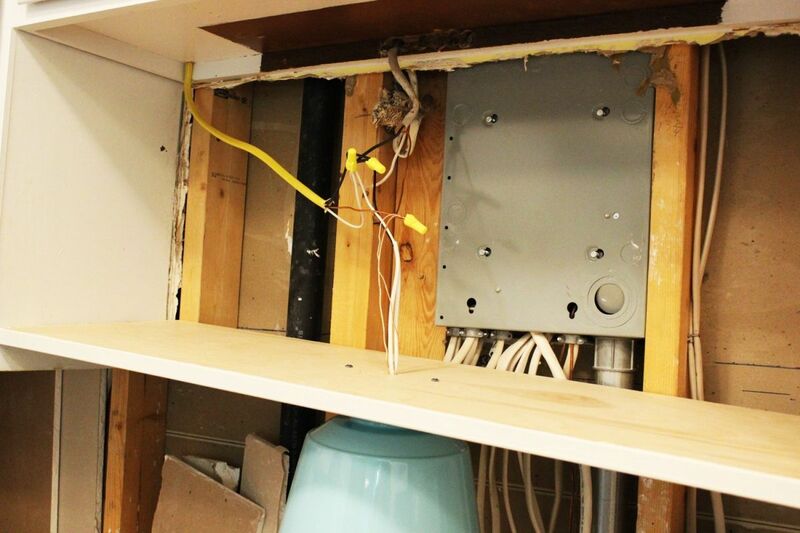 Simply wire and mount your new lighting, and bam-o! Instant update. 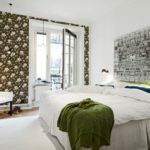 If, however, the lighting doesn’t match up nicely, read on for an easy solution. 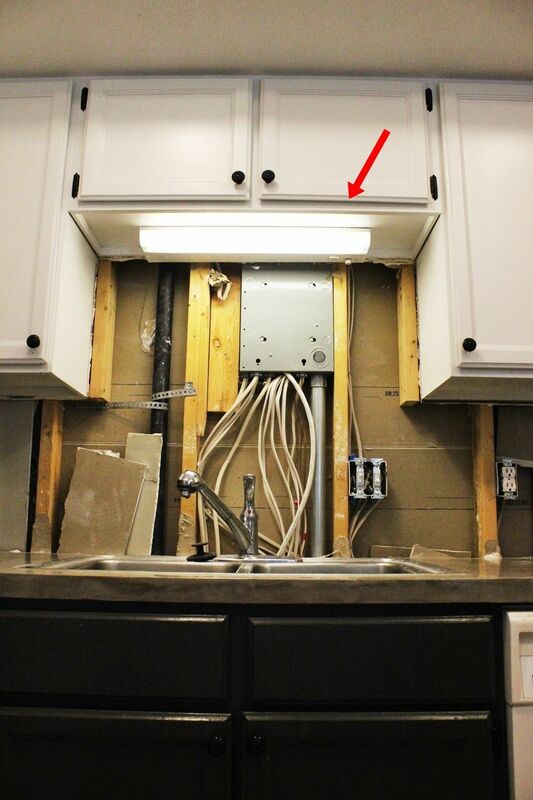 In this instance, the old wiring for the above-the-sink kitchen light came through the cabinet’s lower “lip” or flange area. 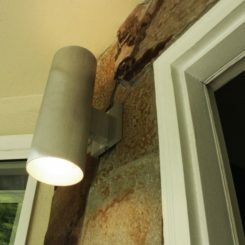 With the new light, this would be completely visible, so we needed to come up with an alternative lighting install plan. 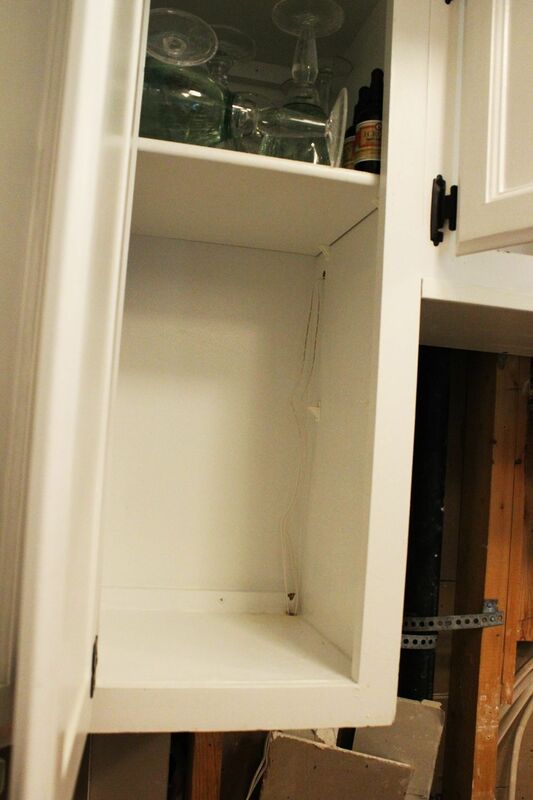 Many cabinets have a kind of recessed bottom shelf, disguised by a lower lip or flange. 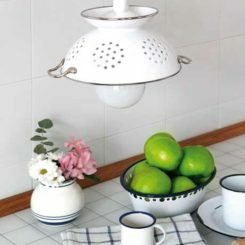 The new modern light fixture is a flush mount, meaning it is designed to attach directly to the ceiling-type surface. 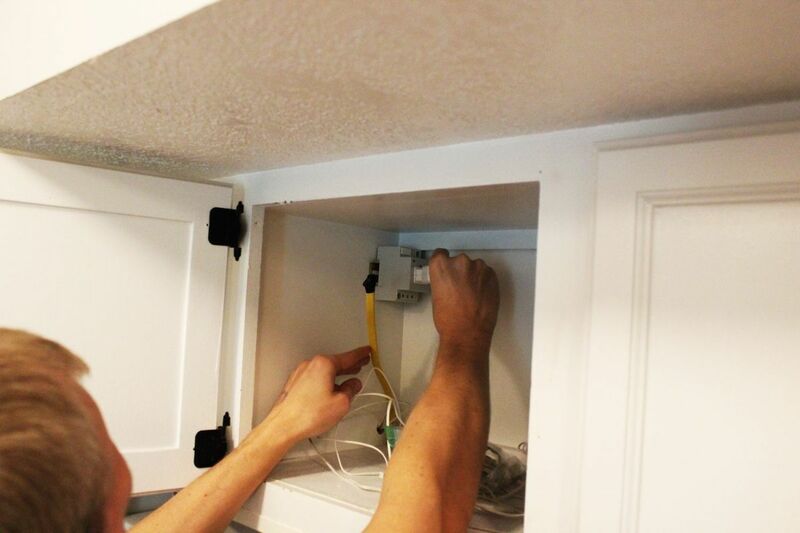 In order to avoid re-routing the wiring AND losing precious cabinet real estate in the upper cabinet, we decided to create a type of soffit under the cabinet to hold the light while providing a hidden storage space for the wiring. 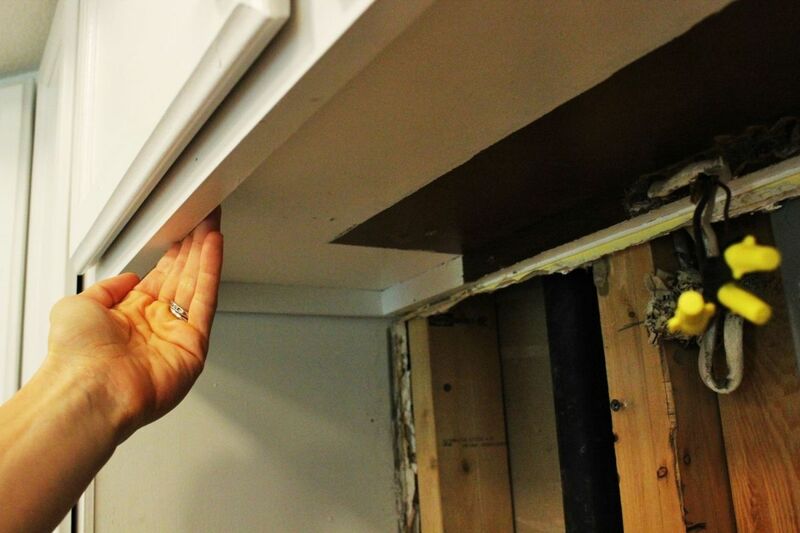 Cut a piece of wood or plywood to fit within your above-the-sink under-cabinet space. 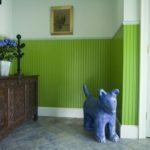 You may want to get a small trim piece for the front edge, depending on your kitchen design and your own style or preference. 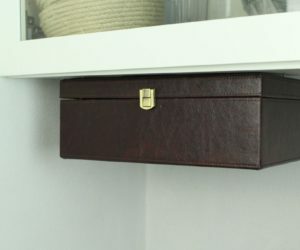 Once the pieces are cut, hold them up flush against the bottom edge of your cabinet lip to make sure they fit perfectly. 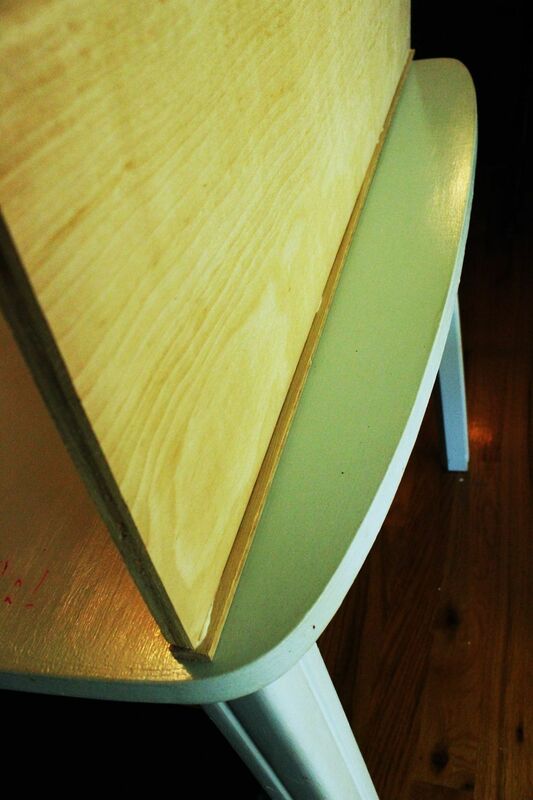 Once you’ve discovered they fit, use wood glue to attach the trim piece to the front edge of the soffit board. 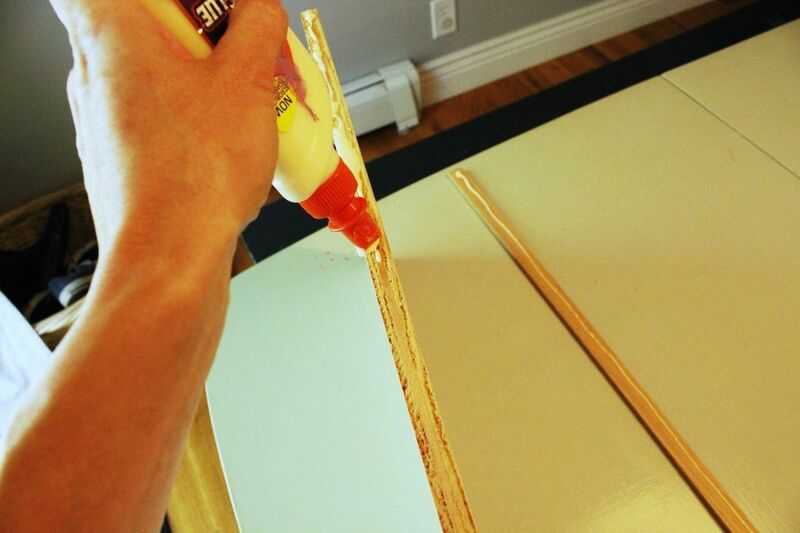 Put a smallish line of glue on both pieces (the trim and the wood edge) for best adhesion results. 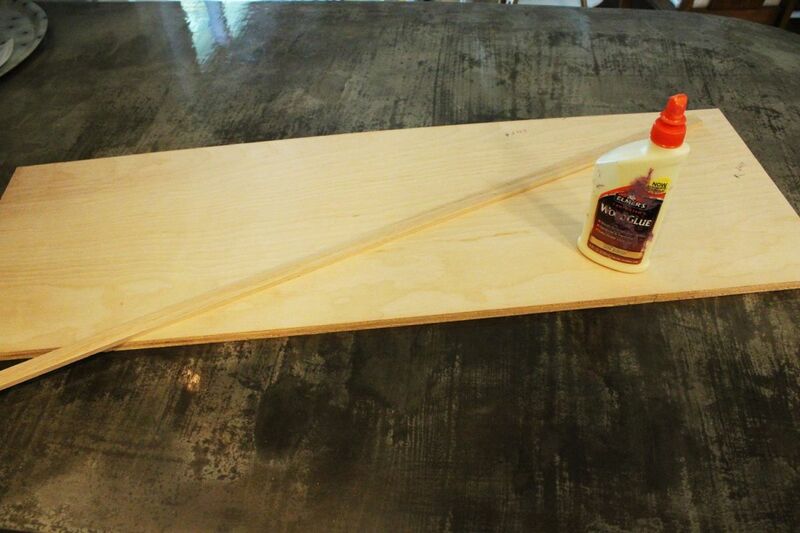 Make sure to keep one edge of the trim flush with one edge of the wood board, if the two are different widths. 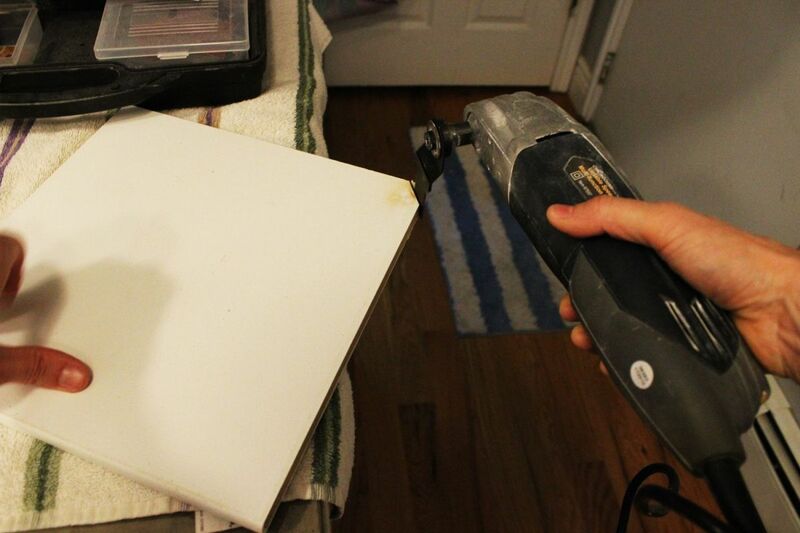 Ensure the pieces are at right angles, then let them dry thoroughly. 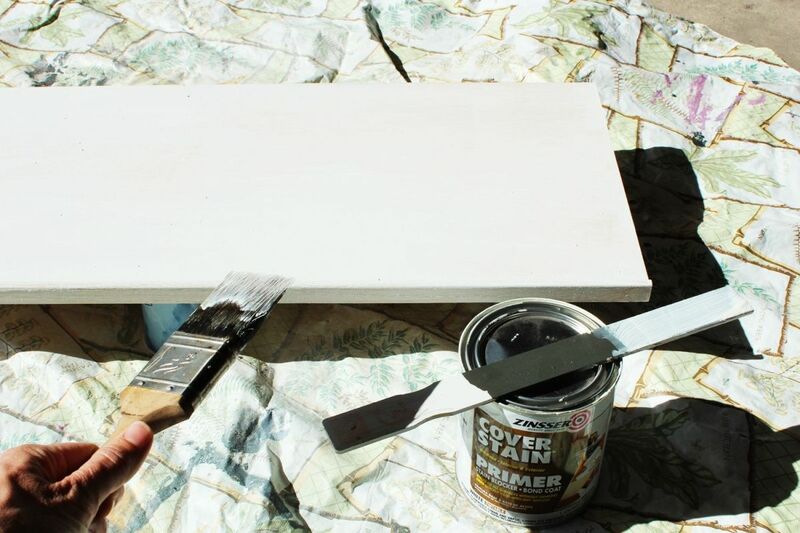 After your soffit board + trim have dried thoroughly, it’s time to prime and paint what will become the exposed sides. 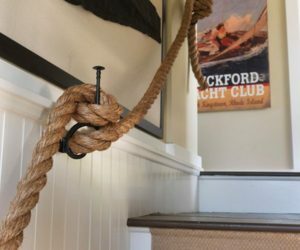 This means you’ll paint the entire trim piece and the UNDER side of the soffit, because that’s the side you’ll see once it is installed above your sink. 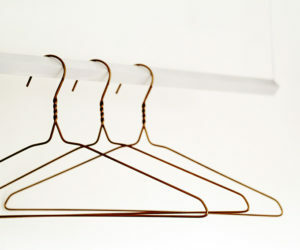 Let all coats dry thoroughly. 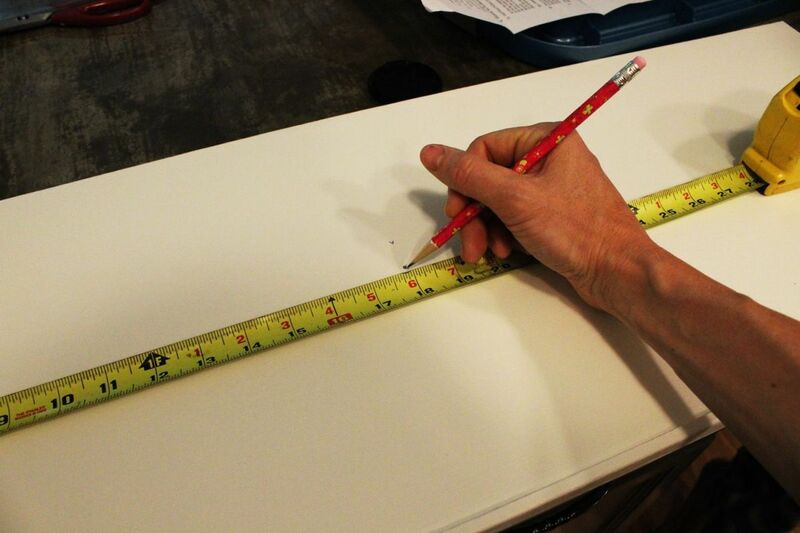 After your board is dry, it’s time to mark where you want your light fixture installed on the board. 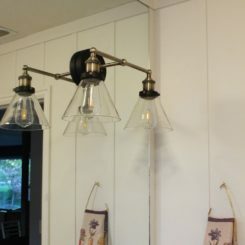 For our Feiss flush single mount fixture, centered was best. 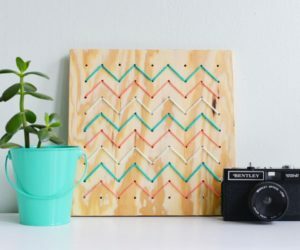 You’ll need to attach the mounting hardware (which would generally be attached to a lighting box but, in this case, can’t be) to the painted side of your board. 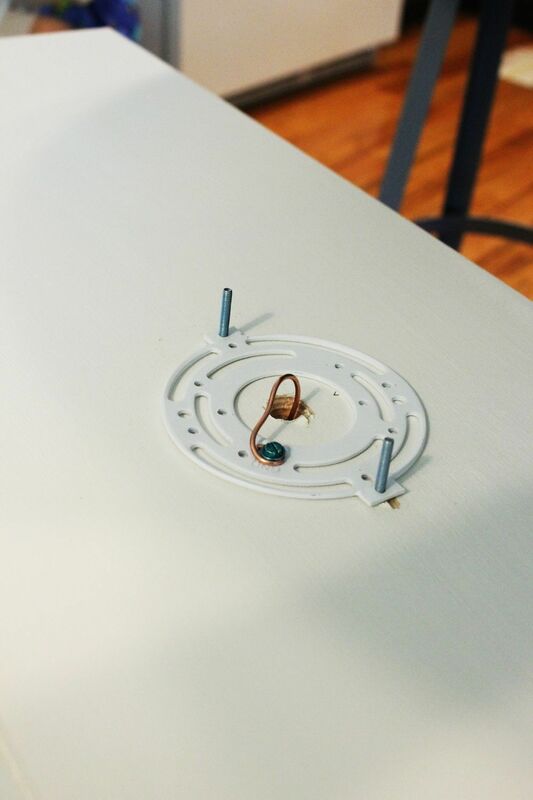 However, you’ll first need to mark the spots where mounting screws and the ground wire screw will be, because these spots will need to be drilled out for a flush fit and for accessibility. The larger center hole in the photo above is for the wires; the two outer holes are for the actual mounting of the light, and the last random-looking hole is for the ground wire, which would protrude from the board and not allow for a true flush mount if it didn’t have a spot to “tuck into” the board itself. 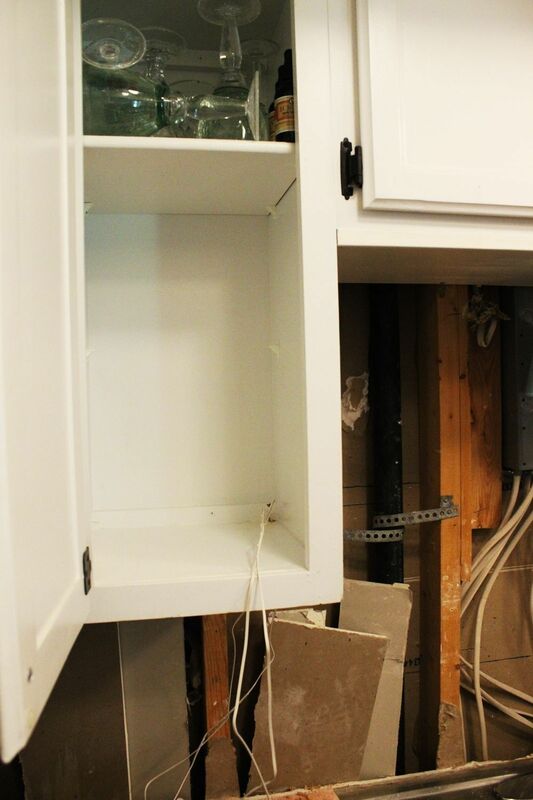 Attach a small ground wire (it only needs to be long enough to reach the already-installed electrical ground wire, which is above your kitchen sink) to the ground screw, then send the ground wire through the center wiring hole. 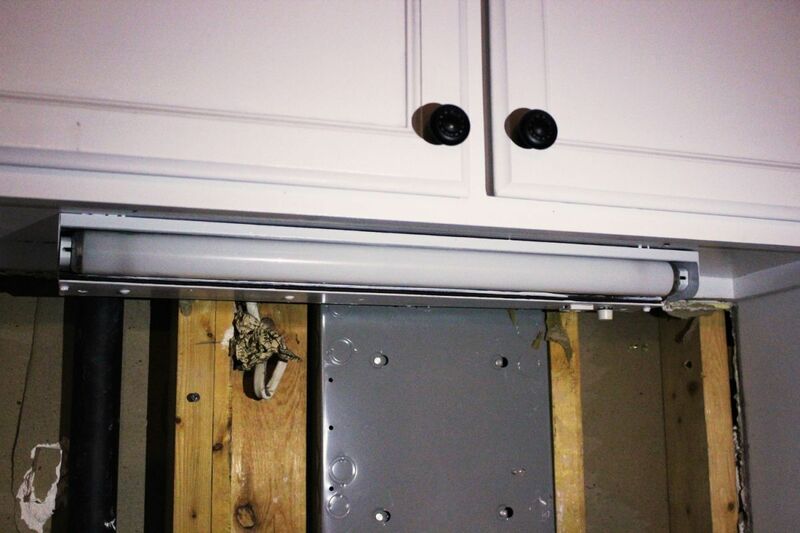 Position your fixture-mounting screws so they are ready to attach your light to the soffit board. 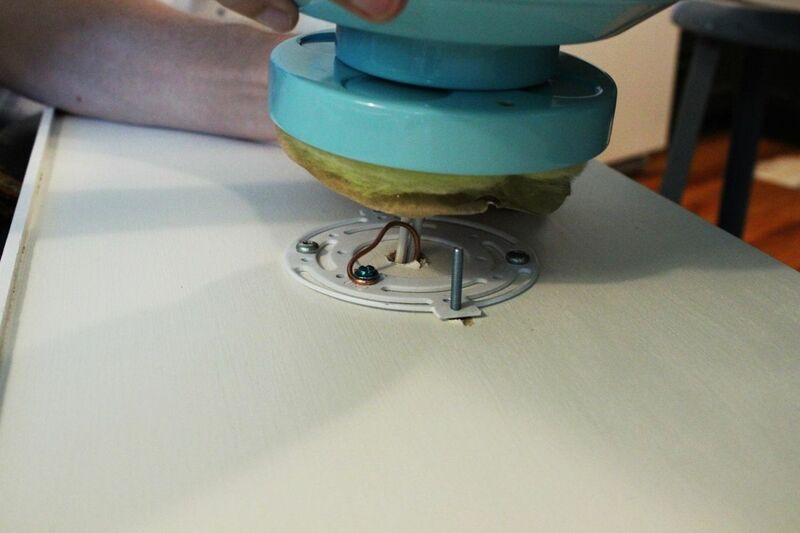 Position your light fixture over the mounting screws. Attach electrical tape around the end of each wire nut for safety. 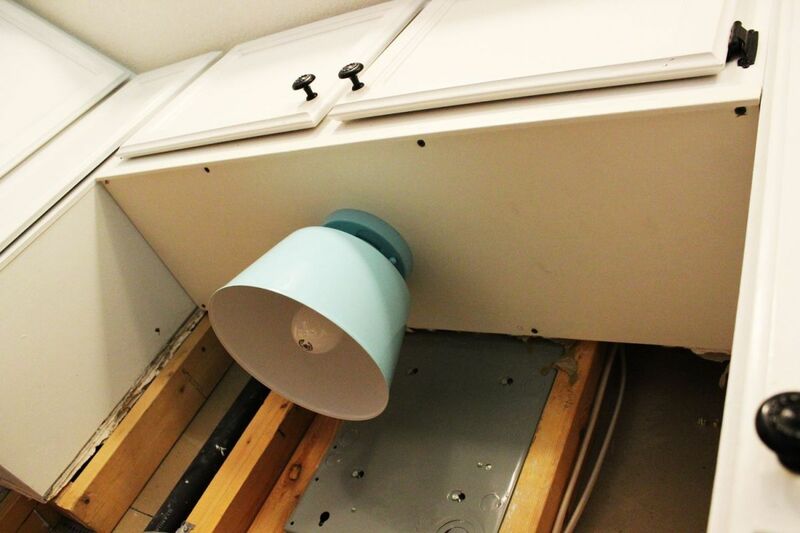 Take note of which cabinet lips/flanges would be best to attach the soffit – the wider, the better. 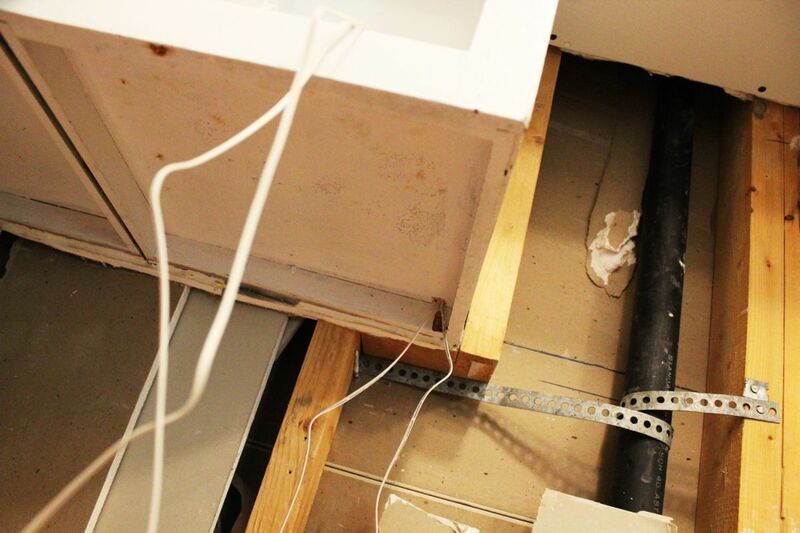 Once all wires are connected and taped, push the soffit board up into the reserved space and screw it into place. 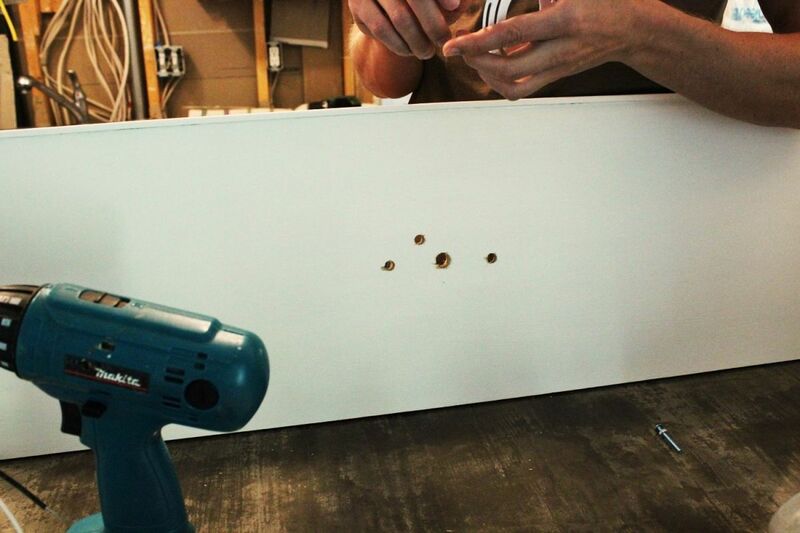 We used eight 1-1/4” screws for a 36” soffit board. Flip on your electrical, then try out the light. Good job! And you can’t even tell it’s a soffit board up there, especially with the trim piece camouflaging it all. 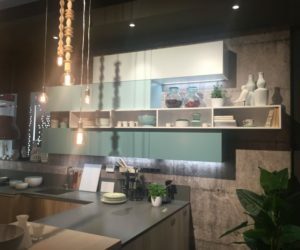 Before you begin your LED under-cabinet lighting project, you’ll want to study your kitchen to determine where the best places for lighting would be. 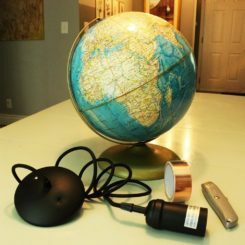 Where does it makes sense to provide a little more light? 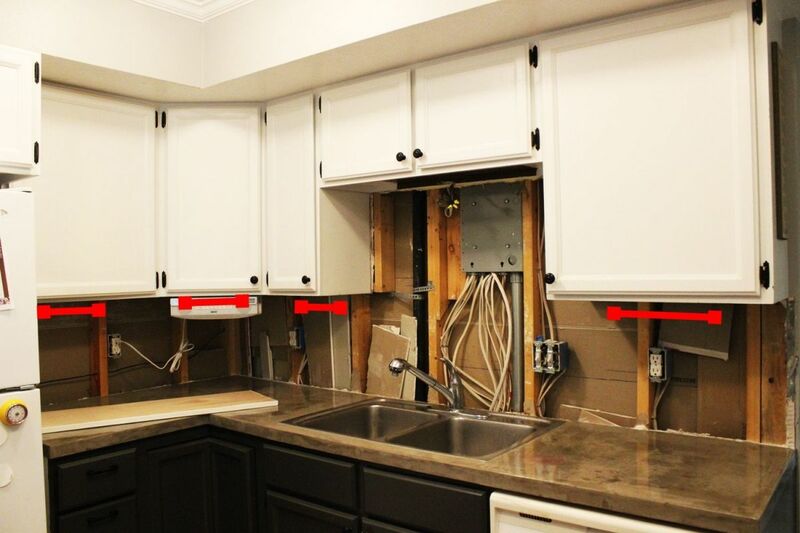 In our small kitchen, the places that made the most sense to us are shown with red lines in the photo above. 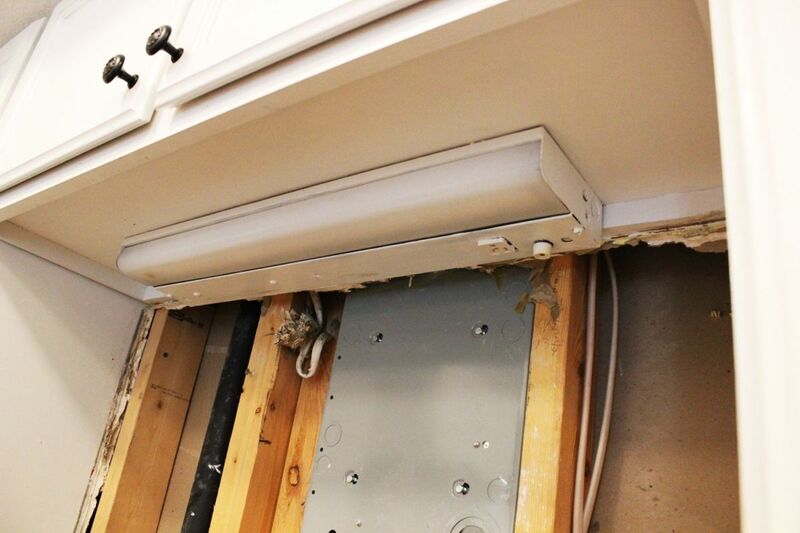 Many varieties of under-cabinet LED lighting are available these days. They can be anywhere from very complex systems to very simple ones. 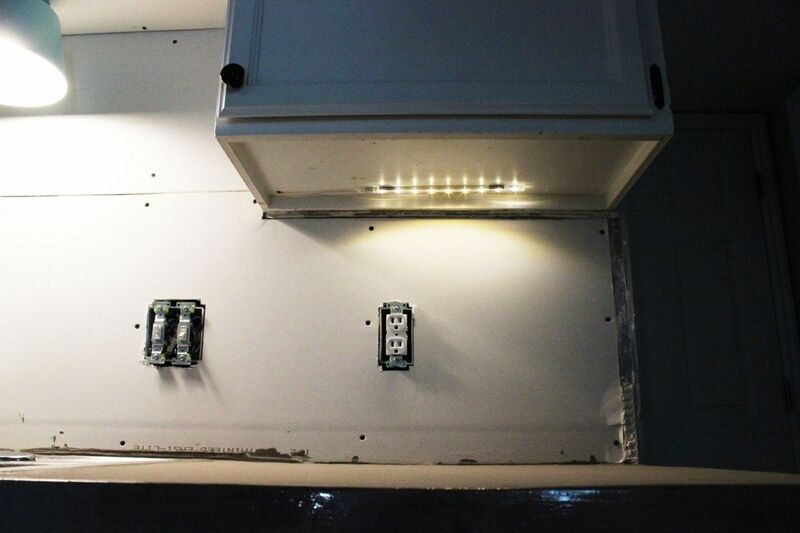 In a small kitchen, a simple LED lighting system is sufficient for a big impact. We chose the Ikea Dioder LED light strips. 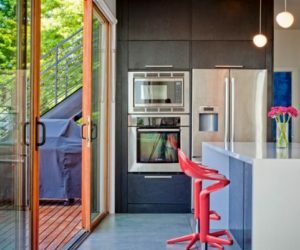 Of course, the DIoder system is designed to be installed and plugged in on the outside of your cabinets. 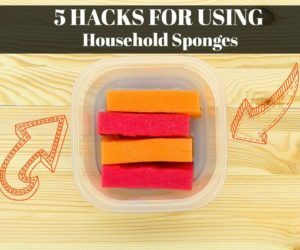 It’s very easy to do that way. 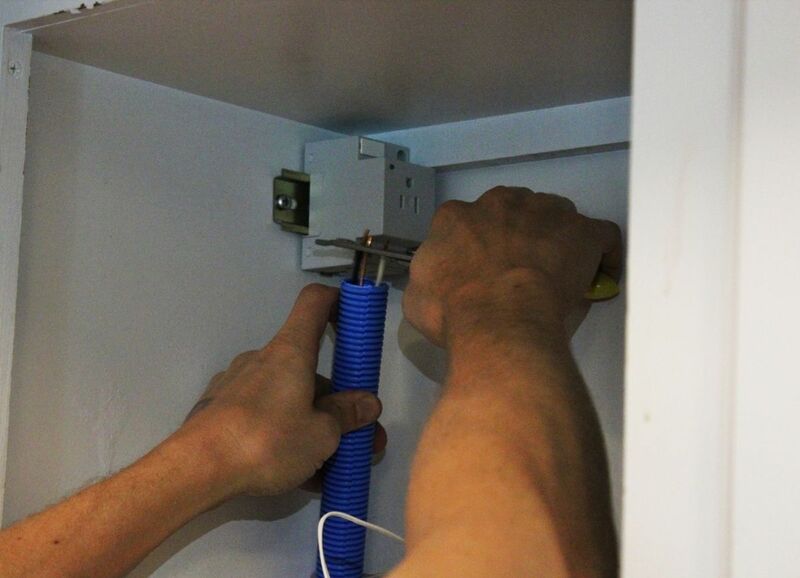 But if you don’t want to deal with all those exposed cords and having an outlet used up with your under-cabinet lighting, you’ll want to go a different route…such as installing a single outlet inside a cabinet so everything is tucked away, out of sight. 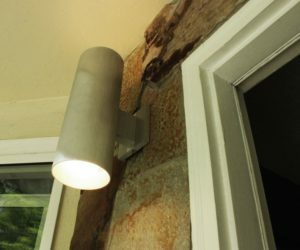 We wanted our LED lights to be connected with the above-the-sink kitchen light, so we wired an outlet from the light fixture wiring. 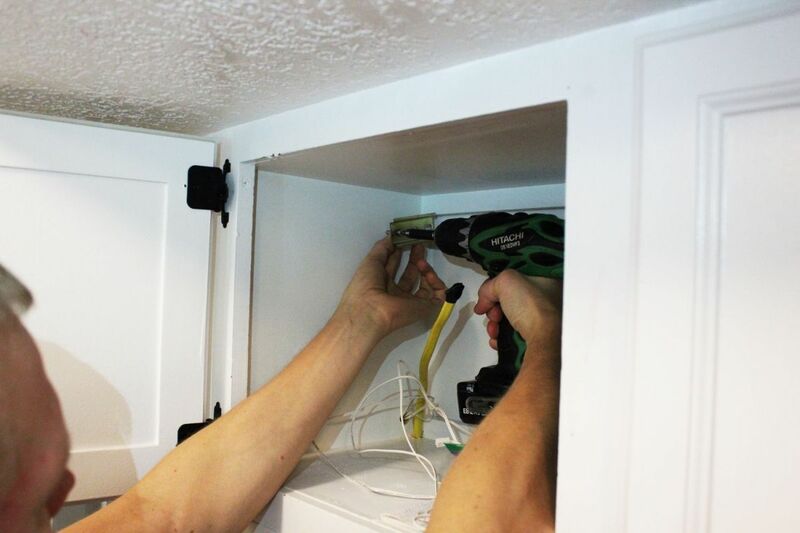 Drill a hole through the bottom of your cabinet, then run Romexwire from the existing electrical source to the single outlet box site. 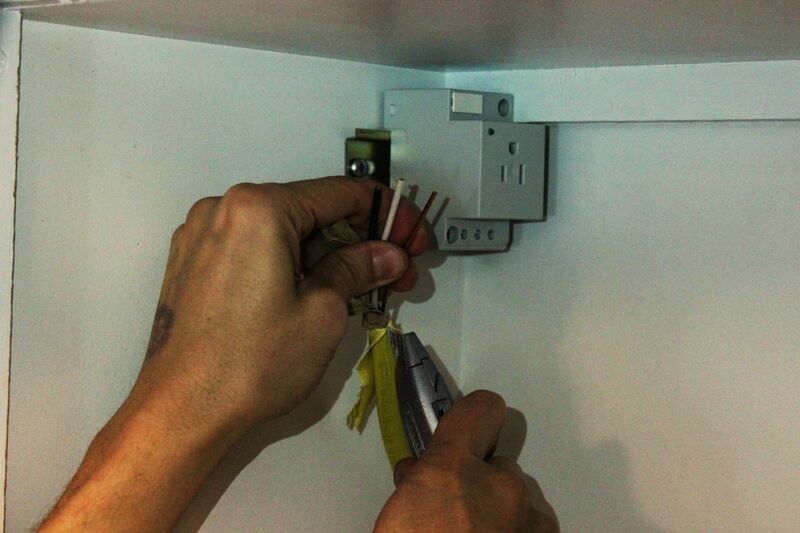 Pull out your single outlet box to determine size and fit for its new installation. This is what it looks like from the side. 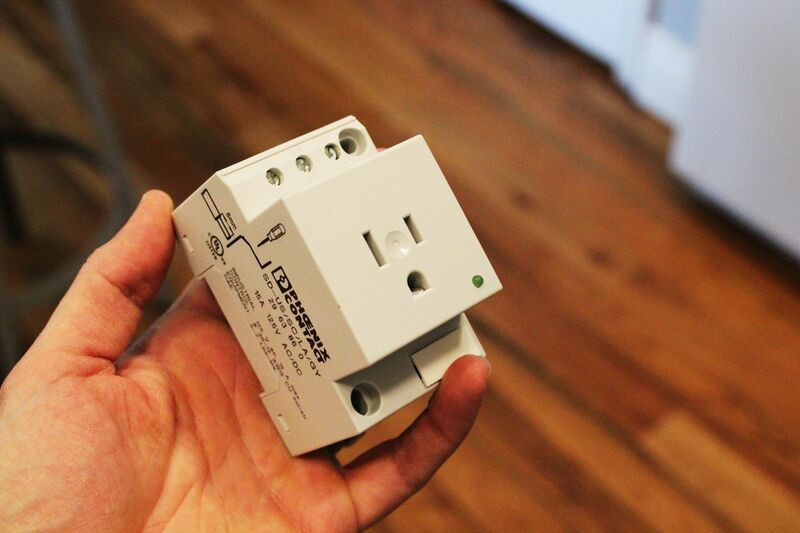 This type of electrical outlet is ideal for post-construction installation because it is small and can be easily mounted onto existing walls, as opposed to traditional outlets, which must be mounted in boxes within the house’s framing. 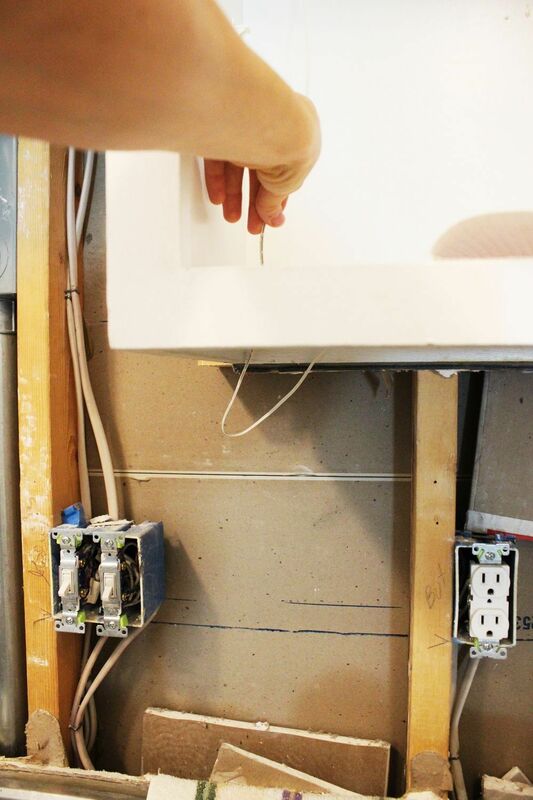 Hold the box up to its position, making sure that (a) the LED light plug will fit, (b) the Romex wires will reach, and (c) the outlet box itself is as out-of-the-way as possible after meeting those two requirements. 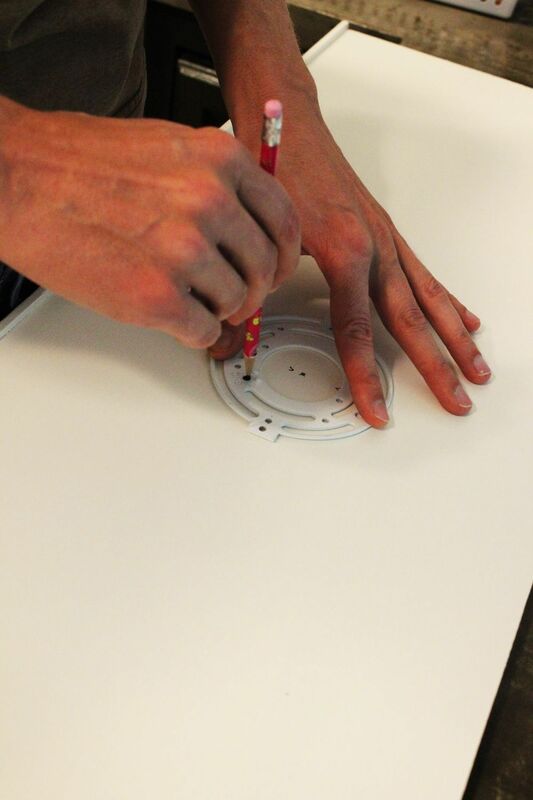 Install the metal mounting plate. Check for level while installing to ensure a flush fit. 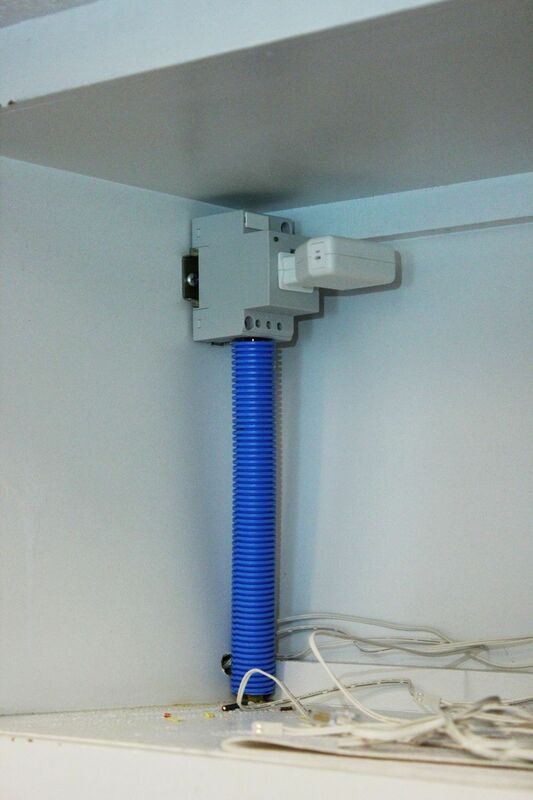 Mount the single outlet box onto the mounting plate. 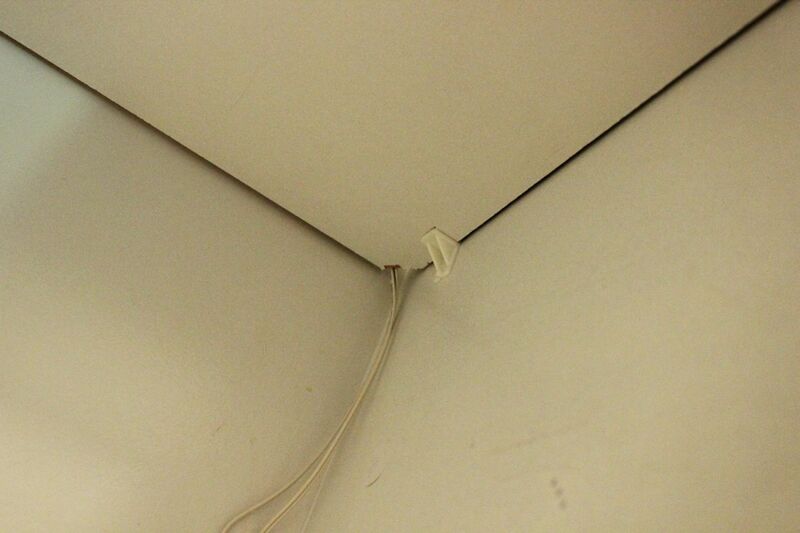 Notice on the box where the electrical wires need to be inserted, and make sure your placement matches accordingly. 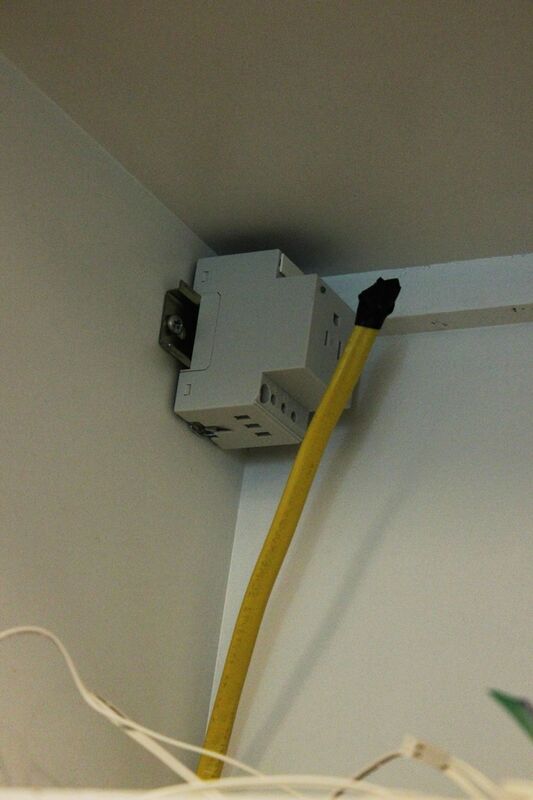 In this instance, the outlet appears to be upside-down (noted in the next photo), but this is because the wire placement holes are on that end. 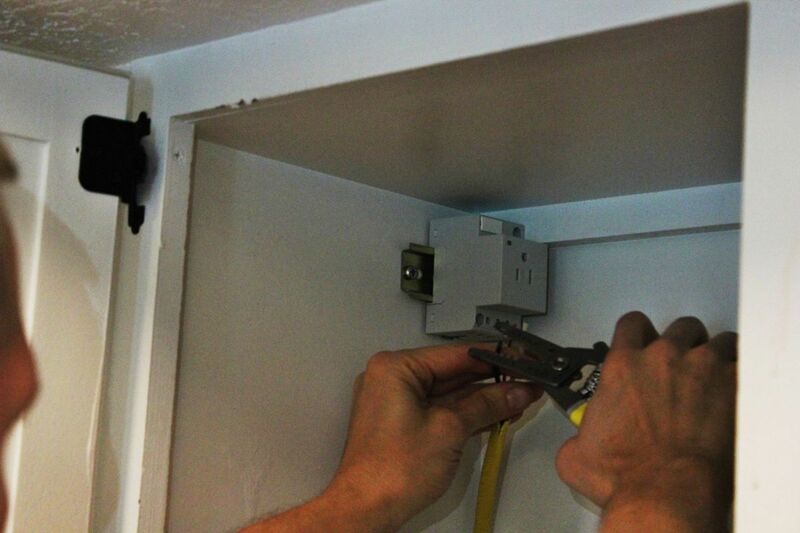 Pull the Romex wire up toward the outlet box. 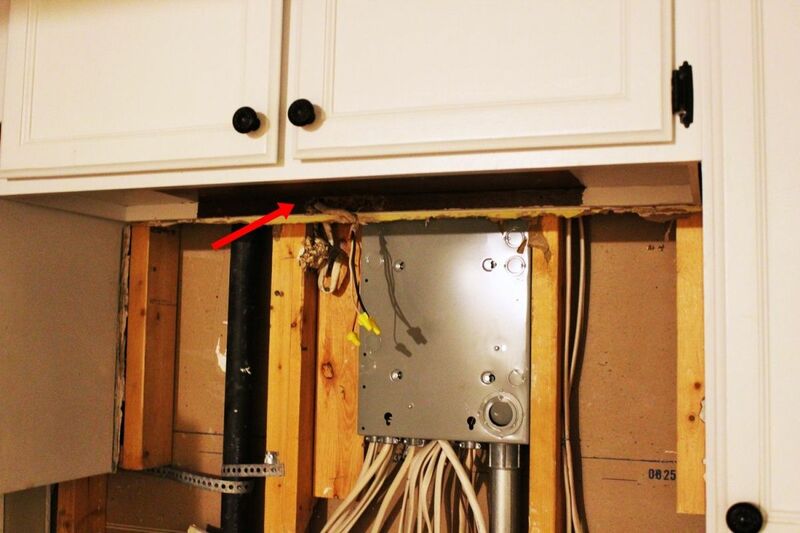 You can leave the Romex wires exposed if you choose, but because the kitchen is potentially a wet space, we recommend protecting the wires with conduit. This is a safeguard that’s easy to do. 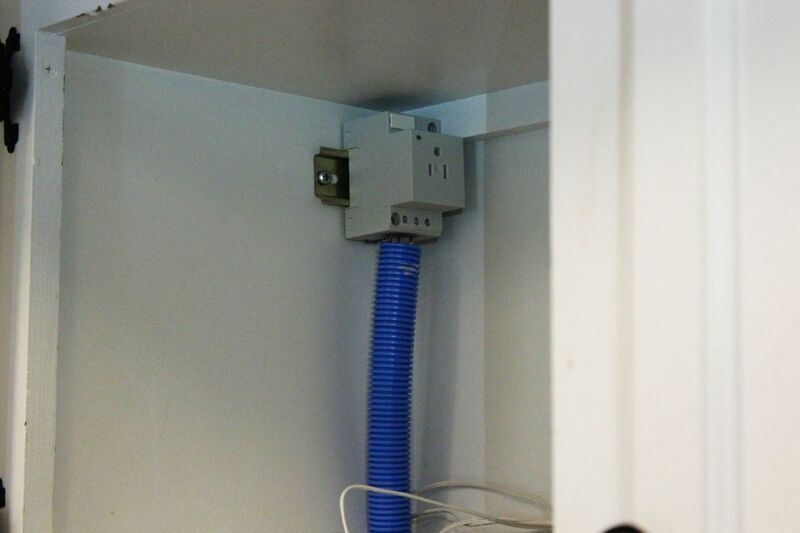 Cut your conduit (the blue plastic piece, seen in the photo above) to reach just below the outlet box. 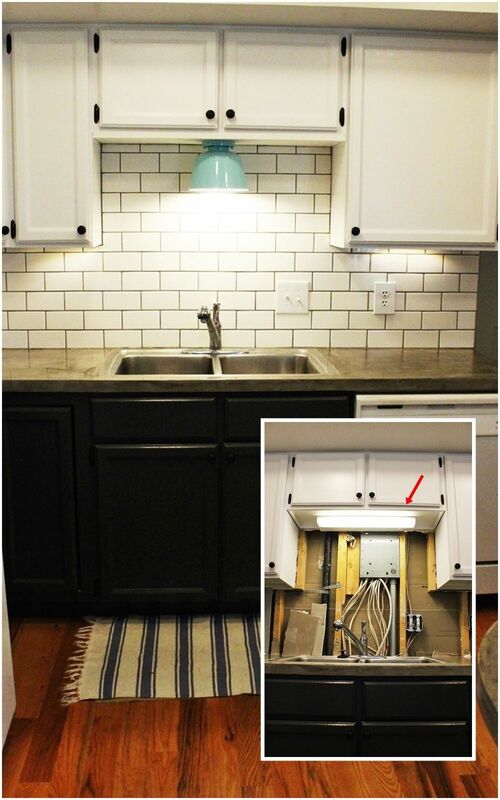 Leave as little space as possible between the top of the conduit and the bottom of the outlet box, preferably <1/4”. 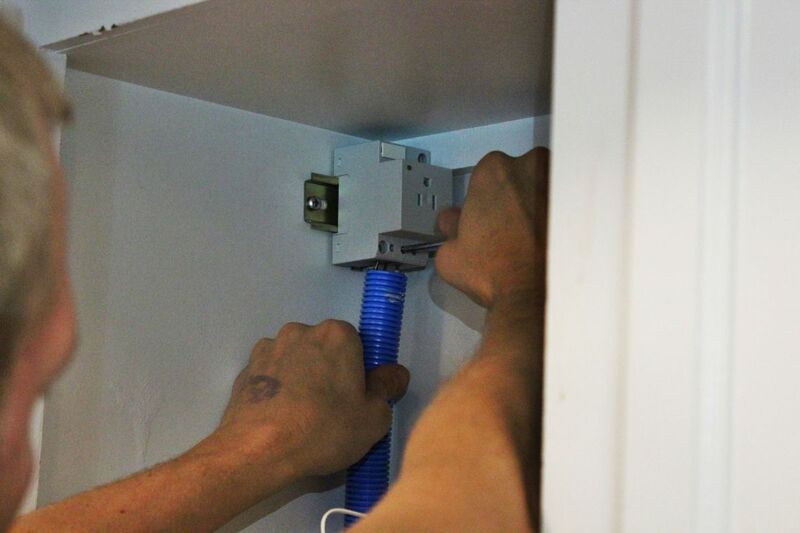 Set the conduit aside, and prepare your Romex wires for installation into the single outlet box. Peel back the yellow casing a few inches, then separate the wires themselves. There should be at least black, white, and ground wires. 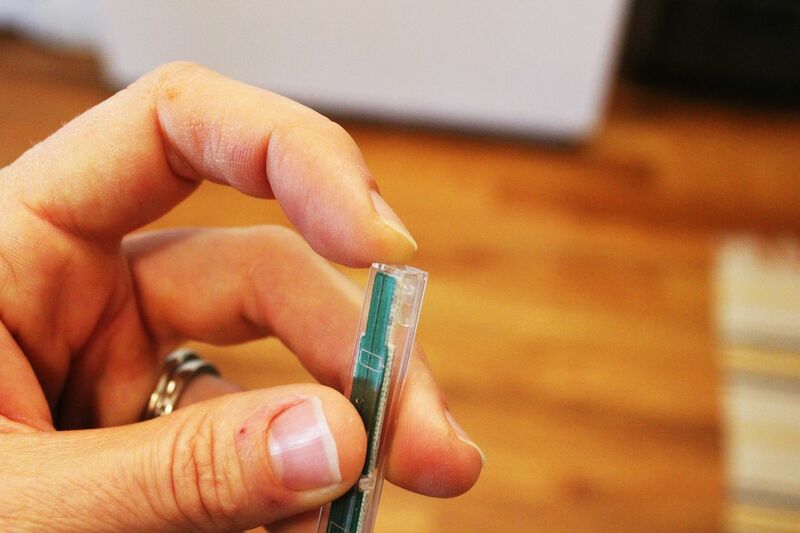 Measuring carefully, trim the wires to be between 1/4″ and 1/2″ longer than the bottom of the box – you want just enough length (but no more than) to pop the wires into their respective installation holes and screw them tight. 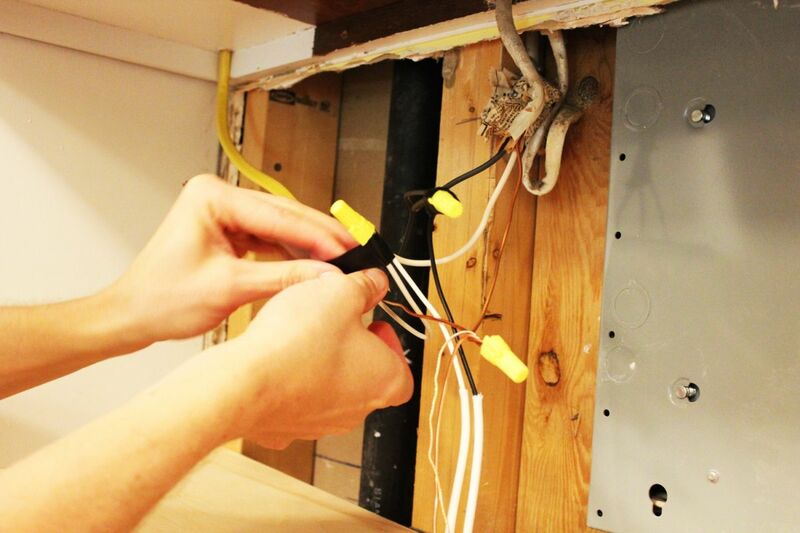 Just as in traditional electrical installation, trim the casings off the end of each wire. 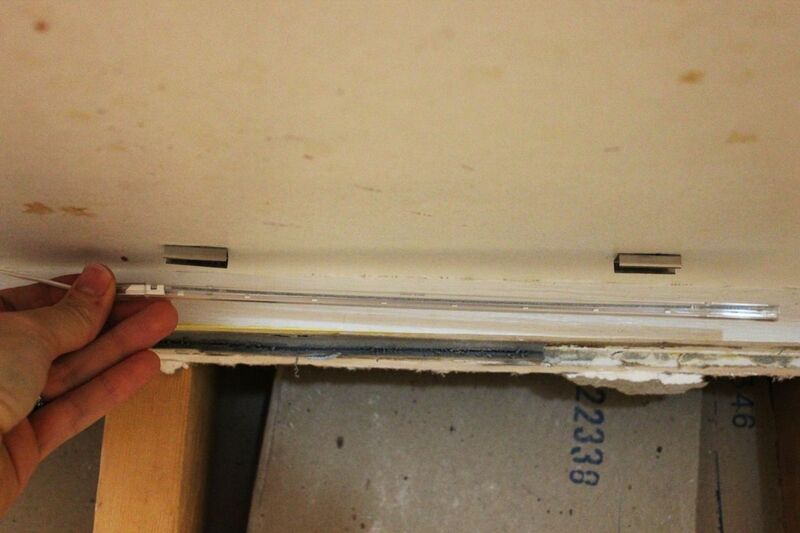 You’ll want to take about 1/2″ to 3/4″ off the end. Slide the wires through the conduit. 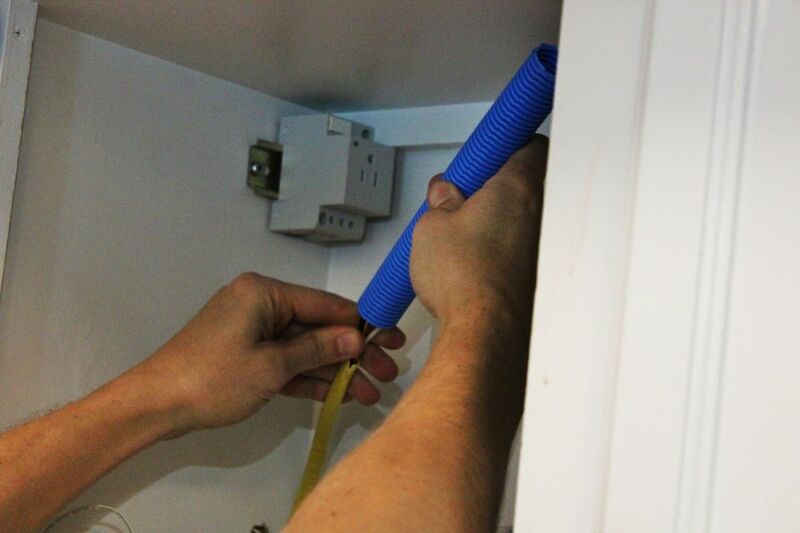 Check the length of your wires again, now that they’re in the conduit. Trim them if necessary. Guide the wire ends into their installation holes. 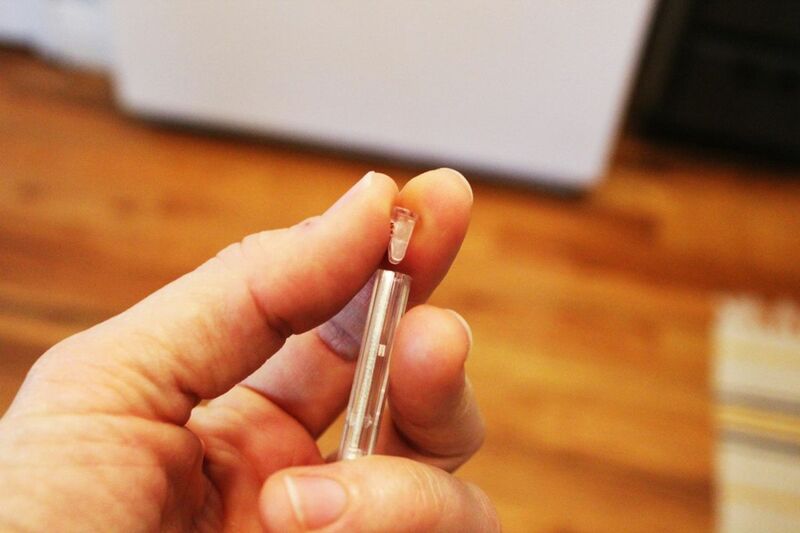 Tighten the wires into place with a screwdriver. The conduit can now be painted out if you wish. This will help protect from moisture as well as provide an extra sheath of protection against snags or bumps or whatever else. 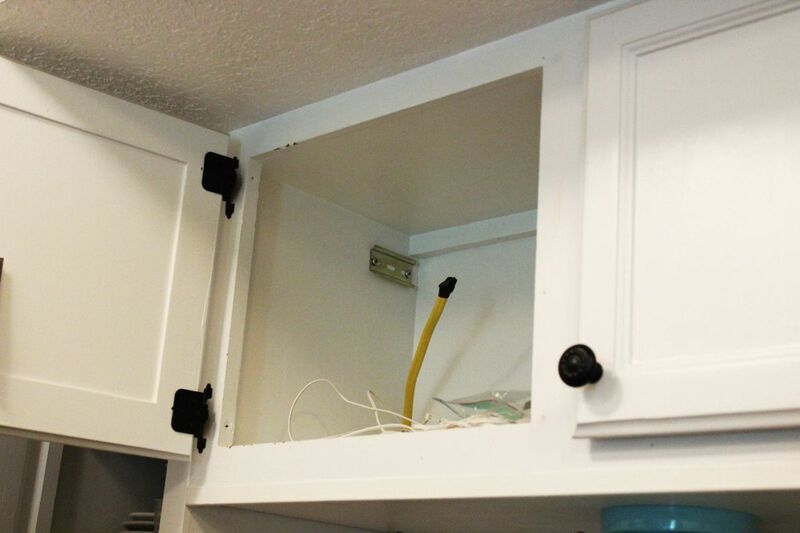 Now you’ll want to get all the LED wires from under the cabinets up to the single outlet box, going inside the cabinets as needed but still staying out of the way of your cabinet contents. 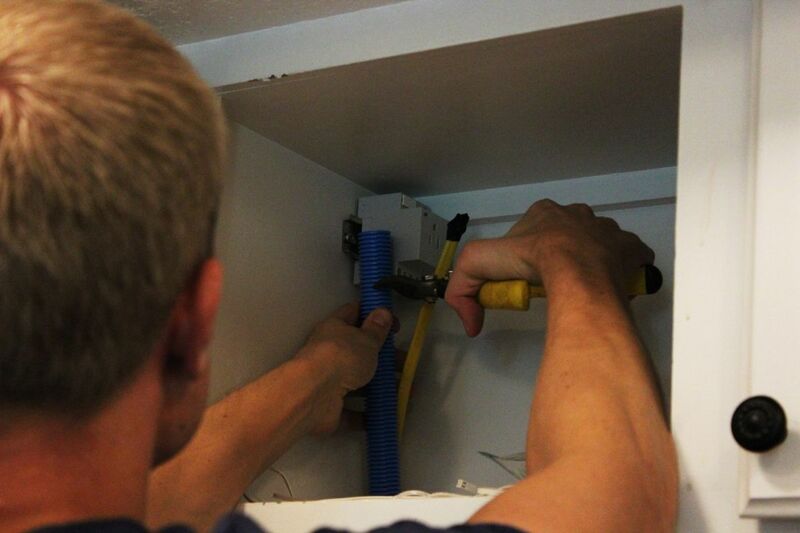 First, drill a hole (make sure it’s large enough to fit as many of the wires and heads through it as you need) through the bottom of the adjacent cabinet. 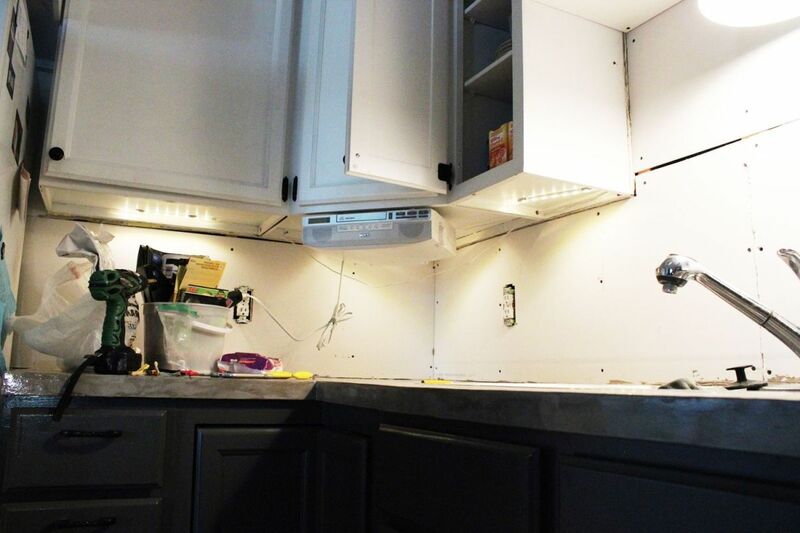 Note: Where you position the LED lights underneath your cabinets, whether toward the front or toward the back, is completely up to you. 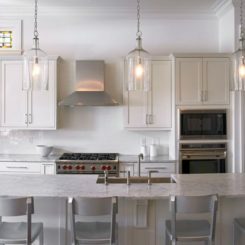 Consider what you’re after – if you want your LED lights to serve as task lighting for your kitchen countertops, install them more toward the front of your cabinets. 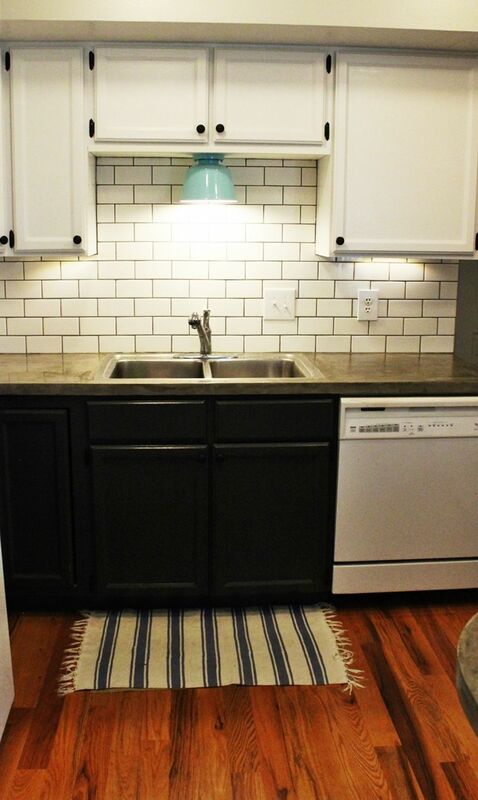 The further back you go toward the wall/backsplash, the greater the drama of reflection. Your choice. 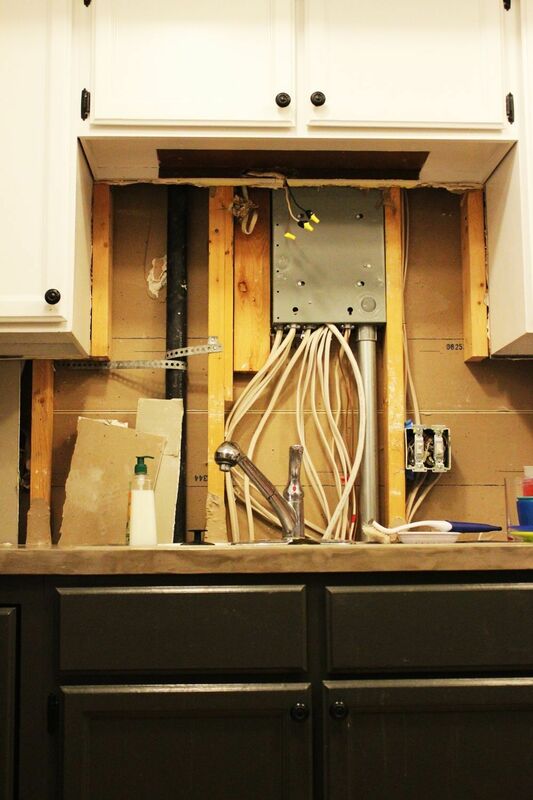 You can see two wires going through this hole; we later added in one more to make it three for this side of the kitchen. 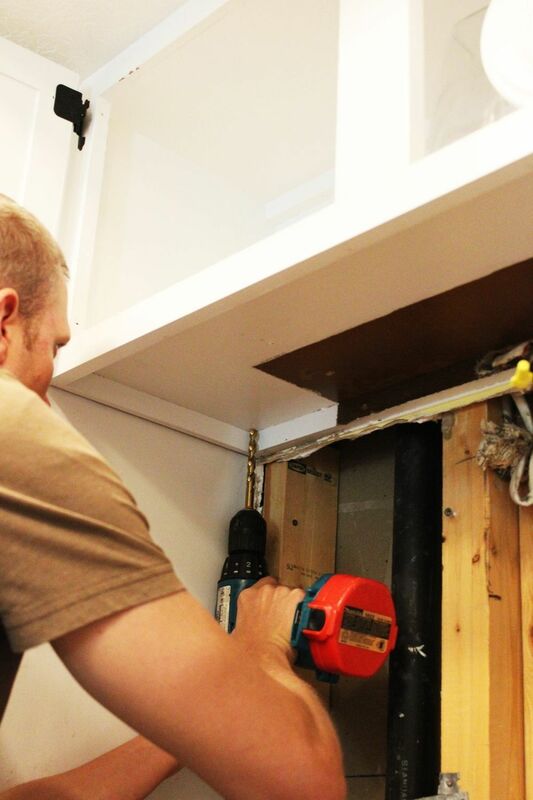 Next, you’ll want to drill a hole through the cabinet wall toward the single outlet box site. Pull all LED wires through that hole. 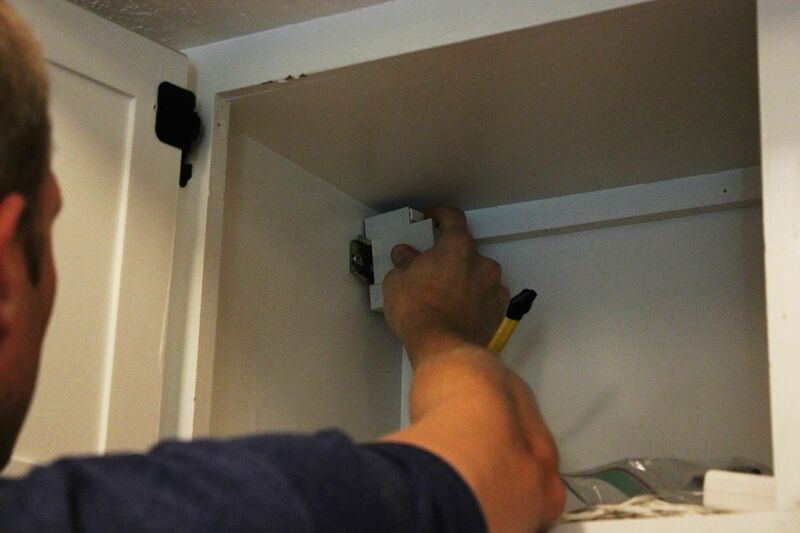 So now you should have the ends of the LED wires at the single outlet box site, with the rest of the wires running out the hole into the side of the adjacent cabinet, then down through the hole in the bottom of that same adjacent cabinet. 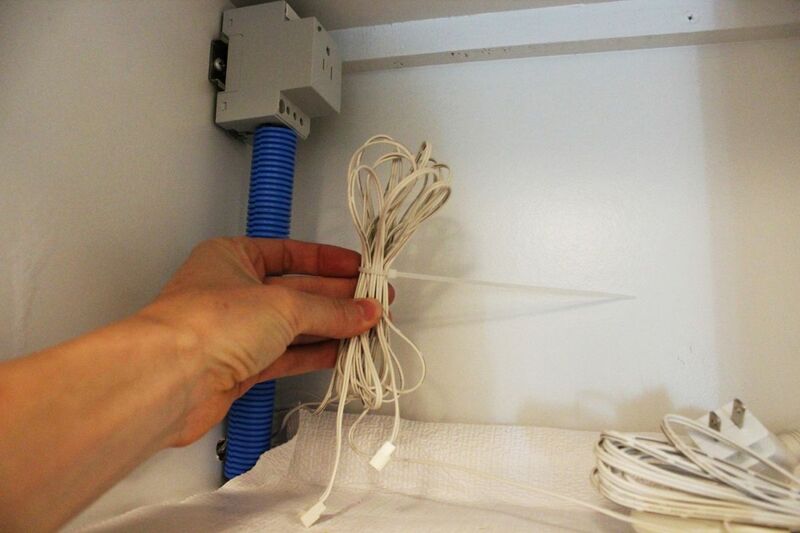 Reinstall the shelf so that the wires pass through the triangular space. 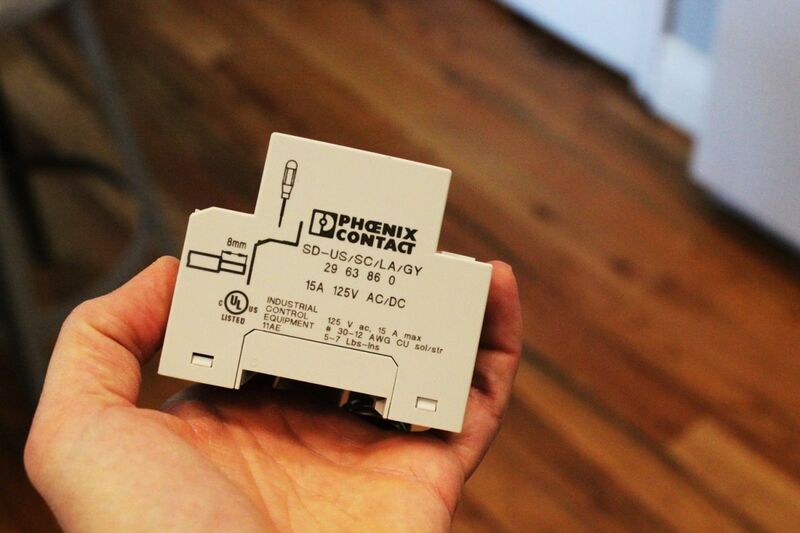 This makes a big difference on the wires’ ability to stay out of the way of the cabinet contents. 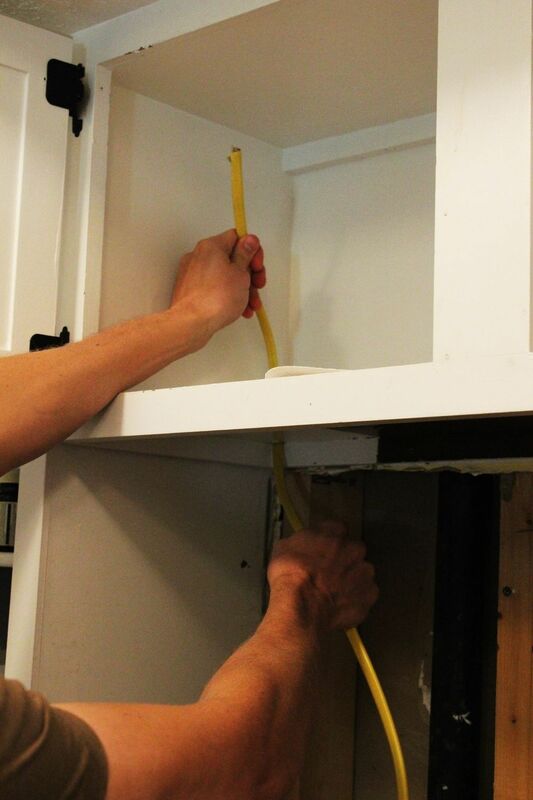 In addition, wires “traveling” to the bottoms of adjacent cabinets will be unseen if you drill holes through the lip (flange) of the lower cabinet edge, then thread the wires through those. Once wires are in place, you’re ready to mount the lights themselves. 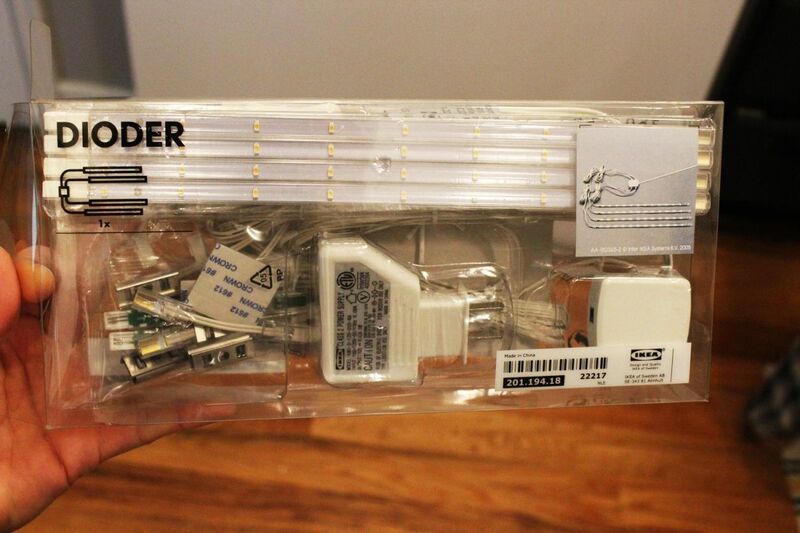 Grab one of your LED light strips. Attach an end cap (if necessary). 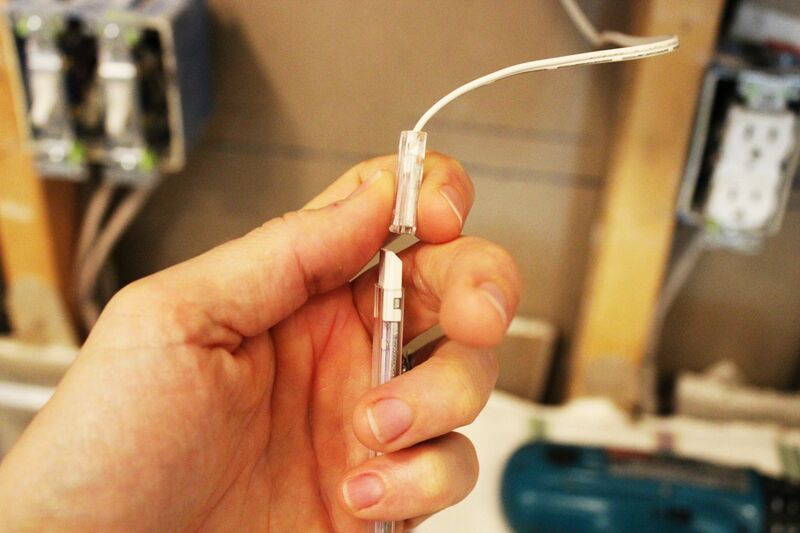 Then attach the wire to the LED light strip. 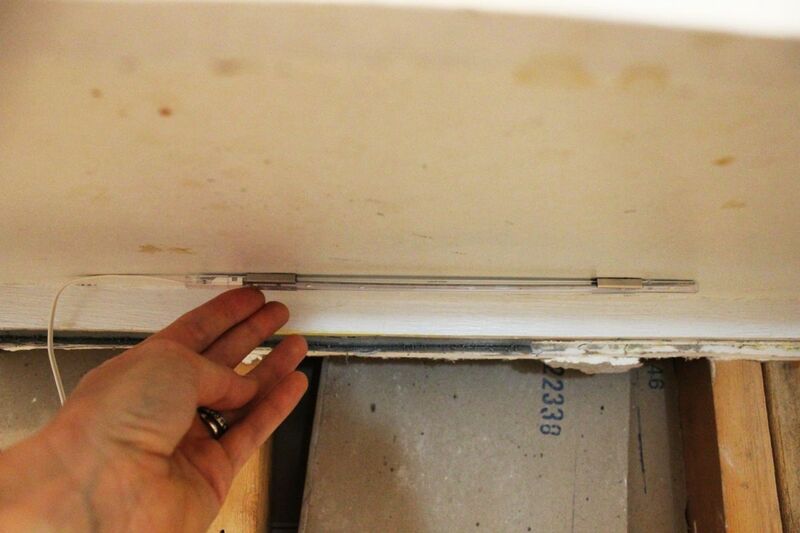 Carefully snap the light strip into place. 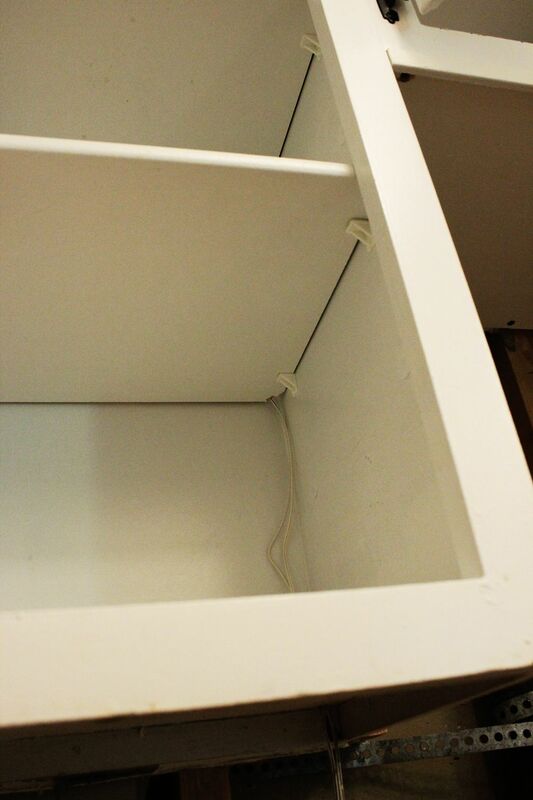 Once the light strip(s) are in place, gently pull the excess wire up through the cabinet bottom hole. 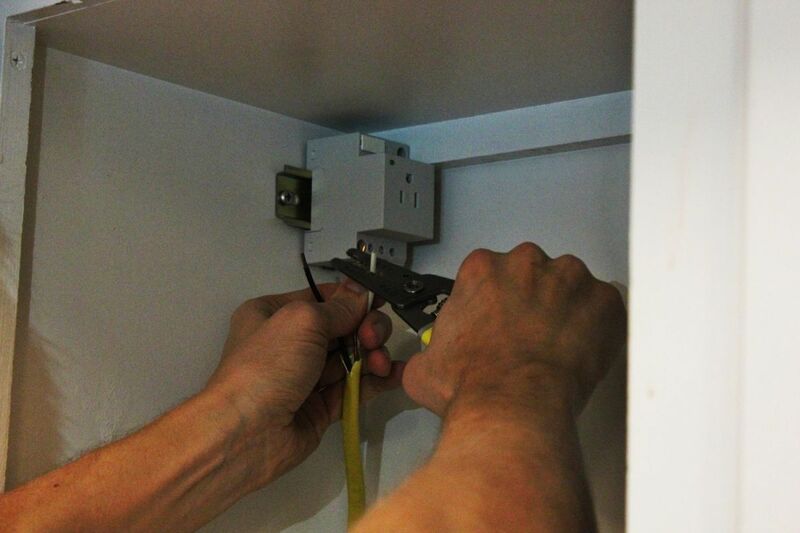 Continue pulling the wires up through the shelves (with their triangular cut-outs) and through the hole closest to the single outlet box site. Click each light’s wire into the Dioder four-slot plug, then connect the plug to the adapter, which should be plugged in to your single outlet box. Flip the breaker, then turn on the light switch. Flip the manual Dioder switch to “on,” then leave it there. 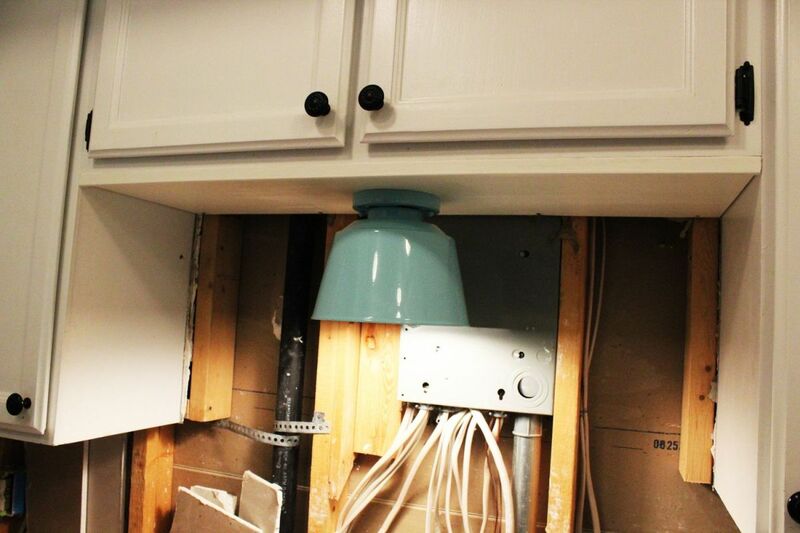 This makes your light switch the control to your under-cabinet lighting, rather than having to worry about installing or operating yet another switch when you want the lights on. Once you’ve ensured you’re wired up and everything is working, it’s time to clean up the wire mess up by your single outlet box. 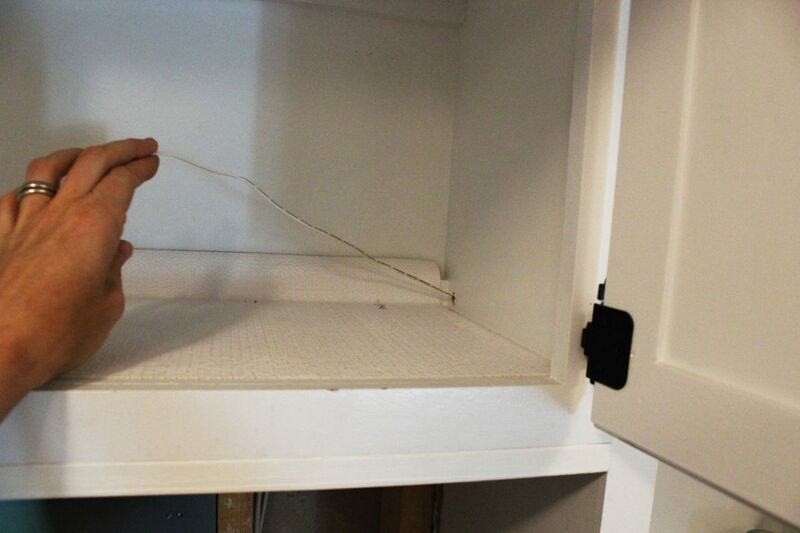 Gently make sure all the wiresare taut, then use zip-ties to corral the excess wire near the outlet site. 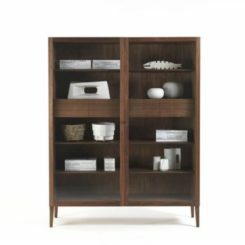 Feel free to mount this mass to the back of your cabinet, if you wish. Congratulations, you’ve done it. That lighting really makes a difference! 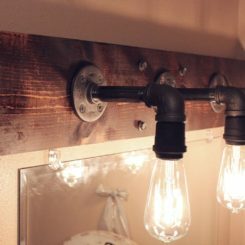 Even when the lights are turned off, a beautiful above-the-sink fixture is pleasant to look at. 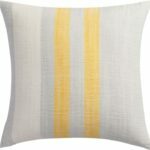 We like how this one adds a pop of color and makes a statement in a sea of white. 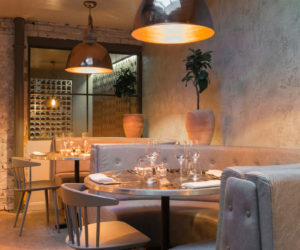 We hope you enjoy your kitchen’s new, updated lighting!